TONIGHT I’M attending a middle aged gig. It’s my first foray into a music arena since I had kids and waved goodbye to my thirties – if you discount the time I took Boy Wonder to see Justin from CBeebies. We nearly didn’t get tickets, of course. I saw the advert in the Sunday Times and received an enthusiastic approval from the Social Secretary. And then did nothing about it until there were only six tickets left. The MEN Arena holds around 25,000 people. I’m sure it’ll be fine. It’s not like it’s Riverdance. 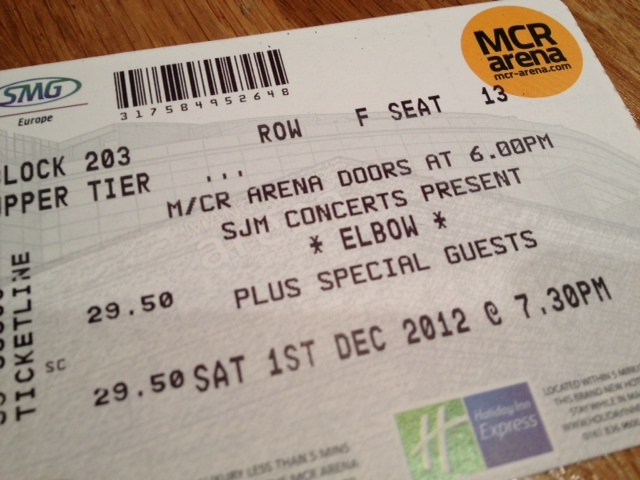 Besides, Elbow like to put a runway from the stage into the crowd, so it’ll be like Guy Winstone is in our front room. The Duchess and I are going crazy: with my Mam down to look after the kids, we’re heading across the Pennines early for some tea and a few drinks. Knowing the Duchess, we’ll probably the first ones in there, becoming Number One Fans for the support acts. We’ll drink too much and miss the first half of the Elbow set because we’re asleep. Such is my excitement, I’ve found myself recalling more youthful times when going to a gig (sorry, that word really does show my age) wasn’t so unusual.